In this tutorial, I will show you how to install Wordpress on Windows Server 2012 with IIS 8. Assume that you have your own dedicated server and you want to install Wordpress. If you use shared hosting provider, all can be done via one click installation via your hosting provider Control panel, or you can ask your hosting provider to install Wordpress for you. Now, how about if you own your dedicated server and you want to install Wordpress on server? Then, please make sure you install PHP Manager, I would recommend you to use http://phpmanager.codeplex.com/. 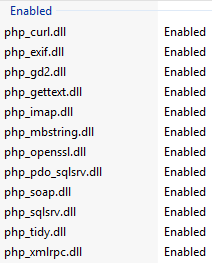 This is good tool and help you to enable and disable PHP extensions. To make things easy, you can install and configure PHP quite easily using the Microsoft Web Platform Installer. When you run the Web Platform Installer (Web PI), you can do a quick search for “sql php” and it comes up a few results. When you select “Microsoft Drivers 3.0 for PHP v5.4 for SQL Server in IIS”, which is what we need, all other prerequisites will be automatically installed as well as dependencies (PHP and URL Rewrite for IIS). This will output information about your PHP configuration (ref: http://php.net/manual/en/function.phpinfo.php). Time to try it out: navigate to the page (likely http://localhost/test.php). If you are greeted with a screen with purple blocks of information about your PHP configuration, you’re all set and you can skip ahead to the WORDPRESS INSTALLATION section. Chances are you’re going to be greeted with an IIS 403.1 error screen, however, which is due to the fact that the user account that IIS is currently using for the anonymous access to your site doesn’t have the proper privileges to access your wwwroot (or equivalent) folder on disk. This is solved quite easily by granting this user (called IUSR by default) access to the wwwroot folder through Windows Explorer or your other favorite method. Upload wp-db-abstraction.php and the wp-db-abstraction directory to wp-content/mu-plugins. This should be parallel to your regular plugins directory. If the mu-plugins directory does not exist, you must create it. Now we can visit the setup-config.php page as outlined above. The steps here are quite straightforward, so I’m not going to walk you through them. You will need to create a user on your SQL Server 2012 installation with SQL Server authentication that has access to a database that you also need to create to use for your WordPress installation. One note about this process: I had some issues when choosing the default selected “SQL Server using MS PHP driver” and went with the “PDO SqlSrv” option the second time to eliminate these issues. If the wizard has trouble automatically creating the wp-config.php file, you can either choose to give IUSR write permissions on the folder you created to hold all your WordPress files or you can manually create the file under that folder and paste the output you see on screen in there (I chose the latter). After the wp-config.php file is created, you can start the installation of WordPress by clicking the link on the bottom of the page you’re on. Done!! Your Wordpress is ready on Windows Server 2012. In this post, I will discuss about hosting node.js application in IIS on Windows using iisnode project. OK, let’s begin. First thing you need to do is install iisnode project side to get the module and samples installed on your Windows box with IIS7 enabled. The hello world sample consists of two files: hello.js and web.config. You will notice that the only difference between this code and the hello world sample from the front page of http://nodejs.org is in the specification of the listening address for the HTTP server. Since IIS controls the base address for all HTTP listeners, a node.js application must use the listen address provided by the iisnode module through the process.env.PORT environment variable rather than specify its own. This handler registration allows the same web site to contain other *.js files (e.g. jQuery libraries) that IIS will continue serving as static files. As of version 0.2.x, iisnode supports hosting Websocket applications in IIS 8 on Windows Server 2012 and Windows 8. You can use any standard node.js modules that implement the Websocket protocol, including socket.io. For every node.js application (e.g. hello.js above), iisnode module can create many node.exe process and load balance traffic between them. The nodeProcessCountPerApplication setting controls the number of node.exe processes that will be created for each node.js application. Each node.exe process can accommodate a configurable number of concurrent requests (maxConcurrentRequestsPerProcess setting). When the overall concurrent active request quota has been reached for an application (maxConcurrentRequestsPerProcess * nodeProcessCountPerApplication ), the iisnode module starts rejecting new HTTP requests with a 503 (Server Too Busy) status code. Requests are dispatched across multiple node.exe processes serving a node.js application with a round-robin load balancing algorithm. With iisnode integrated debugging you can remotely debug node.js application using any WebKit-enabled browser. To help in ‘console.log’ debugging, the iisnode module redirects output generated by node.exe processes to stdout or stderr to a text file. IIS will then serve these files as static textual content over HTTP. Capturing stdout and stderr in files is controlled with a configuration setting (loggingEnabled). If enabled, iisnode module will create a per-application special directory to store the log files. The directory is located next to the *.js file itself and its name is is specifed with the logDirectoryName setting (by default “iisnode”). The directory will then contain several text files with log information as well as an index.html file with a simple list of all log files in that directory. Given that, the logs can be accessed from the browser using HTTP: given a node.js application available at http://mysite.com/foo.js, the log files of the application would by default be located at http://mysite.com/iisnode/index.html. The logDirectoryName is configurable to allow for obfuscation of the log location in cases when the service is publicly available. In fact, it can be set to a cryptographically secure or otherwise hard to guess string (e.g. GUID) to provide a pragmatic level of logs privacy. For example, by setting logDirectoryName to ‘A526A1F2-4E22-4488-B930-6A71CC7649CD’ logs would be exposed at http://mysite.com/A526A1F2-4E22-4488-B930-6A71CC7649CD/index.html. Log files are not allowed to grow unbounded. The maxLogFileSizeInKB setting controls the maximum size of an individual log file. When the log grows beyond that limit, iisnode module will stop writing to that file and create a new log file to write to. To avoid unbounded growth of the total number of log files in the logging directory, iisnode enforces two additional quotas. The maxLogFiles setting controls the maximum number of log files that are kept. The maxTotalLogFileSizeInKB controls the maximum total size of all logs files in the logging directory. Whenever any of the quotas are exceeded, iisnode will remove any log files not actively written to in the ascending order of the last write time. Note that this design of the logging feature allows the node.js application to be scaled out to multiple servers as long as the logging directory resides on a shared network drive. IIS output caching mechanism allows you to greatly improve the throughput of a node.js application hosted in iisnode if the content you serve can be cached for a time period even as short as 1 second. When IIS output caching is enabled, IIS will capture the HTTP response generated by the node.js application and use it to respond to similar HTTP requests that arrive within a preconfigured time window. This mechanism is extremely efficient, especially if kernel level output caching is enabled. The iisnode module composes very well with the URL Rewriting module for IIS. URL rewriting allows you to normalize the URL space of the application and decide which IIS handlers are responsible for which parts of the URL space. For example, you can use URL rewriting to serve static content using the IIS’es native static content handler (which is a more efficient way of doing it that serving static content from node.js), while only letting iisnode handle the dynamic content. You will want to use URL rewriting for majority of node.js web site applications deployed to iisnode, in particular those using the express framework or other MVC frameworks. If you access the endpoint created by the application above, you will notice the application is actually listening on a named pipe address. This is because the iisnode module uses HTTP over named pipes as a communication mechanism between the module and the worker node.exe process. One implication of this is HTTPS applications will need to be refactored to use HTTP instead of HTTPS. For those applications, HTTPS can be configured and managed at the IIS level itself. The iisnode module allows many of the configuration options to be adjusted using the iisnode.yml file or the system.webServer/iisnode section of web.config. Settings in the iisnode.yml file, if present, take precedence over settings in the web.config. Below is the list of options (most of which were described above) with their default values. # the iisnode configuration settings specified in web.config. 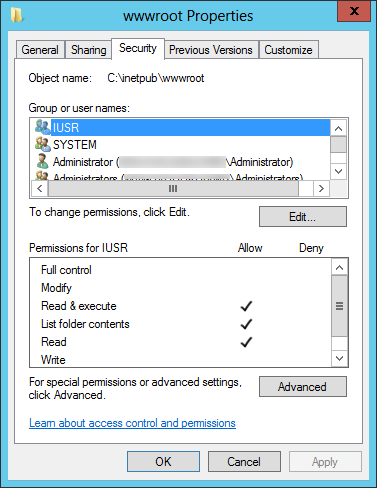 In addition to using web.config and iisnode.yml, you can also configure iisnode by setting environment variables of the IIS worker process. Every setting available in iisnode.yml can also be controlled with environment variables. This option is useful for hosting providers wishing to offer a web based management experience for iisnode. This allows for scripting the configuration of node.js applications deployed to IIS. You scrubbed your site content to ensure all URLs are using their relative form, e.g. “src=’//images\image.png” or explicitly reference the use of HTTPS. You have tested for certificate and SSL related problems like mixed content, appropriately tagging cookies as secure. You have ensured that you follow the best practices guidance for SSL server configuration and verified you get an A on SSLLabs. there are a few things left for you to do, the most obvious being redirecting all traffic to the SSL version of your site! You should probably monitor your CPU usage during your peak so to ensure you have some headroom. This isn’t likely to be a problem as most web-servers are not CPU bound but it’s always good to check. If you are familiar with the IIS configuration you’re probably asking yourself what about the “Require secure channel (SSL)” option in the IIS MMC? Unfortunately this doesn’t do redirecting it only requires the use of SSL on a given site/folder/file. This approach has a number of benefits, for one having this module allows you to leverage remapping for other purposes also for example maintaining old links that have SEO value. From a security standpoint it’s also a good approach as it keeps this decision one of policy that is enforced in a central place. Install the URL Rewrite module (x86, x64). Add a rule to rewrite all HTTP URLs to HTTPS. Open your “web.config” with your favorite editor. Now you can go to your website over HTTP and you will see you are redirected to the HTTPS instance of the site.